Lots of people ask me what I do for for Thanksgiving, so I thought I'd describe what I did this year. The Turkey. I bought a 14.6-lb heritage turkey from Heritage Farms USA. It arrived, as scheduled, on Tuesday, cold but not frozen. I generously salted it under the skin on Wednesday morning, to give it 24 hours. On Thanksgiving day, I rinsed it well, then put it breast side down over ice packs. Just before cooking, I dried it and rubbed it with Michael Chiarello's fennel spice rub. Cooked on a V-rack 45 minutes breast side down at 450, then turned and cooked at 325 for 1 hour 45 minutes. The breast was perfect, the dark was not, so I put the thigh/leg quarters back for 15 minutes at 500. I have to say that I found the bird to be difficult to deal with because the joints were so tight; it was very hard to separate the thigh/leg quarters, which usually fall away of their own weight. The taste was excellent, particularly the breast meat, which was moist and had an intense turkey taste; the dark meat was almost too intense. Gravy. Michael Chiarello's recipe for a classic roux-based gravy, made with fantastically rich turkey stock made with chopped up wings and necks. The stock (another Saveur recipe) made all the difference. Dressing. On the side, not in the bird. Used the recipe for sage stuffing from an old Gourmet, but with mixed herbs. The crowd loved it. My wife and I thought it needed some crunch. Sweet Potato Gratin, with lots of sage, from Ottolenghi. 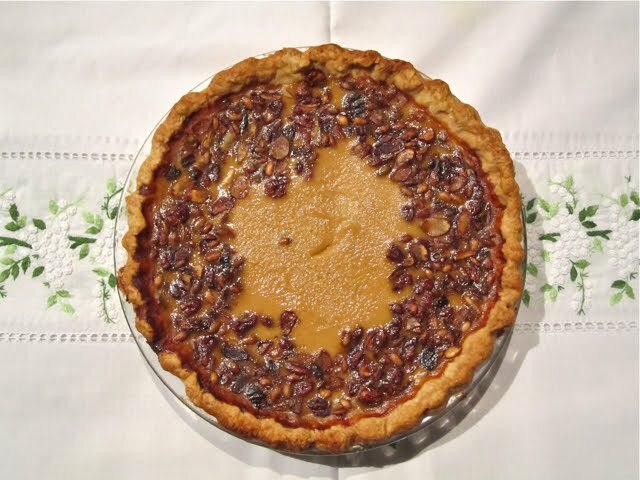 Wonderful and simple; I prepare it the day before and it was in a perfect state to cook on Thanksgiving Day. French beans and snow peas with hazelnuts and julienned orange peel, also from Ottolenghi. Delicious and can be cooked in advance for assembly on the day of. Pumpkin Pie. Used America's Test Kitchen's excellent recipe for a light yet flavorful pie, which incorporates candied yams, and an idea I got from Saveur to top it with some caramelized nuts and julieneed candied ginger. The result was deeply flavored (although different from the traditional pumpkin pie) and beautiful (see picture above). Lots of other things, including a simple salad, desserts baked by my mother-in-law, cranberry chutney made by my mother, and hors d'oeuvres from my sister-in-law, but the foregoing is what I cooked. Now the question is what to do next year. Which to repeat and which to change? But I have a little time.